If the Runner has fewer than 6credit or no unspent clicks when a successful run on this server ends, you have 1 additional click to spend your next turn. If the Runner would gain enough credits to have more than 6 when the run ends (e.g. through a run initiated by Dirty Laundry or High-Stakes Job), does Manta Grid still trigger? The credit amount requirement for Manta Grid’s ability is a part of the trigger condition, so the number of credits the Runner has when the run ends is the amount that is checked. Any changes in credit amount due to other triggered abilities will not stop Manta Grid from triggering. If the Runner trashes Manta Grid after the run in which it triggers (e.g. with Political Operative or on another run), does the Corp still get an additional click on their next turn? Yes. Once an ability is triggered, it exists independently of its source. So what's nutty with this card that differentiates it from Nihongai Grid is that "no unspent clicks" clause. That allows you to use An Offer You Can't Refuse for a "damned if you do, damned if you don't" effect: give the corp an agenda point, or let them score an agenda out of hand next turn. 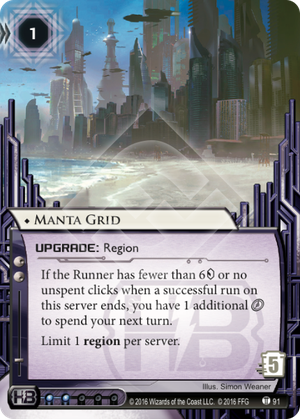 Any sensible runner will let you do the former unless it will win you the game, and if 1 point is enough to win the game Manta Grid ensures you win the next turn. Manta Grid is the most realistic and effective combo you can run with An Offer You Can't Refuse, granting you a Biotic Labor at less influence or a 1 point agenda for fewer clicks. How to use this: Harmony Medtech: Biomedical Pioneer. Between Medical Breakthrough, Clone Retirement, Braintrust and Philotic Entanglement, getting to 5 points has never been easier, and Manta Grid lets you close the deal without taxing that 12 influence too highly.